The cgi-bin folder contains executable CGI scripts. If the file should be placed out of the cgi-bin folder,.htaccess should be created additionally. Create a file with a .py extension, for example nctest.py in the /home/cPuser/public_html/cgi-bindirectory (where cPuser is your actual cPanel username). 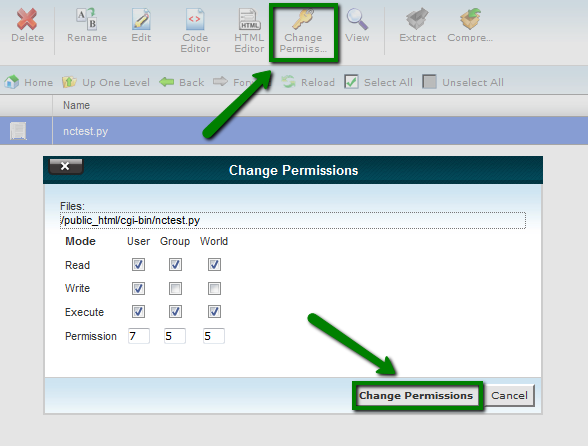 print "How to run Python scripts in cPanel"
NOTE: The file should start with the path to the Python scripts that is /usr/bin/python on our servers, but you can run the whereis python command via SSH to check the directory. 3. Create the file with the .py extension, for example, nctest.py in the /home/cPuser/public_html/cgi-bindirectory (where cPuser is your cPanel username). 5. Open the file and add the necessary code. To save the changes, click Crtl+O and press Enter for Windows or Command+O for Mac OS. If you would like to run the Python script not in the cgi-bin folder, it is necessary to add a special code to the .htaccess file in the same directory where the Python file is placed.